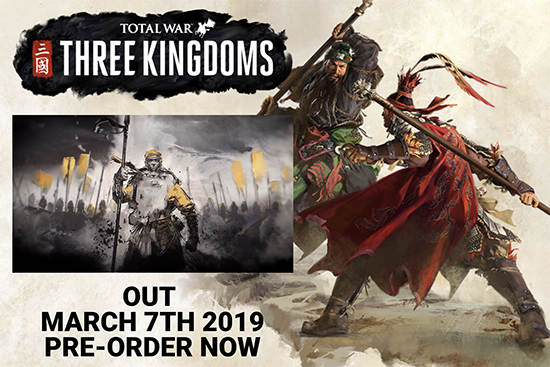 Feral Interactive today announced that the historical strategy game Total War: THREE KINGDOMS will be released for macOS and Linux in spring 2019, shortly after the Windows release on March 7th, 2019. Developed by Creative Assembly and published by SEGA for Windows, this is the first game in the multi-award winning Total War series to be set in ancient China. The year is 190 AD. China, a beautiful but fractured country, cries out for a new emperor and a new way of life. Unite it under your rule, forge the next great dynasty, and build a legacy that will last through the ages. Choose from a cast of 11 legendary warlords, and recruit heroic characters to aid your cause. Dominate your enemies on all fronts: military, technological, political, and economic. Build powerful friendships, form alliances, and earn the respect of your foes. Commit acts of treachery and betrayal, and master the art of political intrigue. "With spectacular environments and a striking Chinese art style, THREE KINGDOMS offers an atmospheric new land to explore and conquer," said David Stephen, Managing Director of Feral Interactive. "The vivid characters, sweeping narrative, and flamboyant wushu martial arts mark a big step forward for the Total War series."